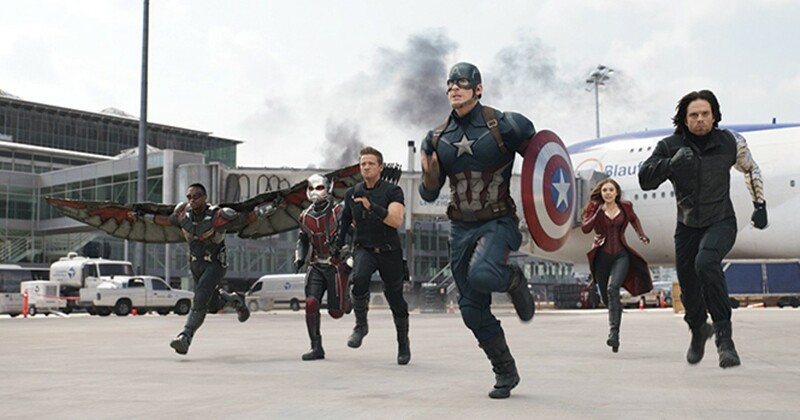 Captain America: Civil War serves up fun and focuses on perpetuating the MCU brand. During one of the occasional lulls between battles royale in Captain America: Civil War, the synthetic humanoid Vision (Paul Bettany), in a conversation with the Scarlet Witch (Elizabeth Olsen), contemplates the growing number of nigh-apocalyptic catastrophes during the eight years since Tony Stark announced his super-hero identity in Iron Man. The United Nations has proposed an accord whereby the Avengers would be placed under international rule, rather than playing by their own rules as freelance villain-fighters, and Vision is among those who think this oversight is needed. Perhaps, he suggests, the growing number of "enhanced" individuals is its own invitation to more threats, in a self-perpetuating cycle. He's certainly on to something, and in a more meta-aware sense than the philosophical battle at the center of the movie over who watches the watchmen. Because the Marvel Cinematic Universe is, at this point, a self-perpetuating cycle. The movies aren't just connected to one another, with plots that inform one another; each one exists to make sure the next one can as well. Which isn't to say that they haven't done an impressive job over those eight years of making that process generally satisfying. While the title may suggest this is a Captain America movie—and the directing team of Joe and Anthony Russo returns from 2014's Captain America: The Winter Soldier—this is, for all practical purposes, Avengers 2.5. With international pressure mounting for that institutional control over the Avengers' actions after massive collateral damage in their previous battles, various team members respond to the situation differently. Tony Stark (Robert Downey Jr.) leads the faction that, whether for pragmatic or emotional reasons, thinks the Avengers need that governing hand. And Captain America (Chris Evans) leads those who are skeptical that any institution wouldn't ultimately begin to use the Avengers to serve its own agenda. A similar moral quandary about the consequences and responsibility for titanic super-battles also fueled the recent Batman v Superman: Dawn of Justice, and while the action at times stops dead in Civil War to allow characters to articulate that policy debate, it is at least more clearly articulated than in BvS. These characters have been fleshed out over the course of several movies now, with their relationships defined both by shared experiences and unique personalities. The script by Christopher Markus and Stephen McFeely never seems to stack the deck against one side or the other in this conflict, building to the point where the potential rift between Cap and Iron Man feels as consequential as any grand slugfest full of exploding thingamajiggers. Of course, there are grand slugfests full of exploding thingamajiggers, and they're an interesting mix of old-school action like an extended car chase, and the centerpiece showdown between a dozen team-vs.-team superheroes on a German airport tarmac. The latter is loads of fun—even if the Russos aren't nearly as deft at navigating the terrain of multiple theaters of battle as Joss Whedon was in the two Avengers films—particularly at finding new individual showdowns featuring participants like Ant-Man (Paul Rudd), Falcon (Anthony Mackie), Winter Soldier (Sebastian Stan) and Black Widow (Scarlett Johansson). The biggest impression, however, may be made by two brand-new characters—and this is exactly where the Marvel Cinematic Universe is both brilliant and frustrating. The African warrior-king Black Panther (Chadwick Boseman) and the brand-new teenage Spider-Man (Tom Holland) both join the fray for various reasons, pumping up the sense of discovery; Holland in particular lends an appealingly goofy nervous energy to every one of Spidey's fights with various Avenger opponents. Yet Civil War can't help but feel at times like a commercial for those characters' upcoming stand-alone features, with expository pauses required to introduce them. Even more than most of its MCU predecessors, Civil War feels bloated with its sense of serving a larger corporate interest than this particular story. There's certainly a level on which it's silly to gripe that a comic-book movie—based as it is in serialized storytelling—keeps pulling from the previous movies and pointing toward the future ones. As long as they continue to deliver well-crafted characters and a sense of fun, they'll thrive. It just might never be possible to achieve greatness, at least as long as the central purpose of any given movie is making sure that the cycle remains unbroken.